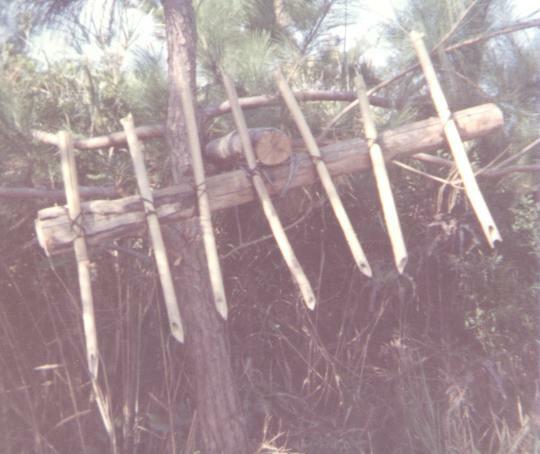 Viet Cong Malayan Gate "Bamboo Whip"
There are several methods of employing grenades as boobytraps. 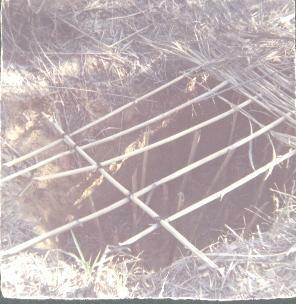 The more common ones used are given here, but the employment of this type of boobytrap is limited only to the users ingenuity and materials at hand. 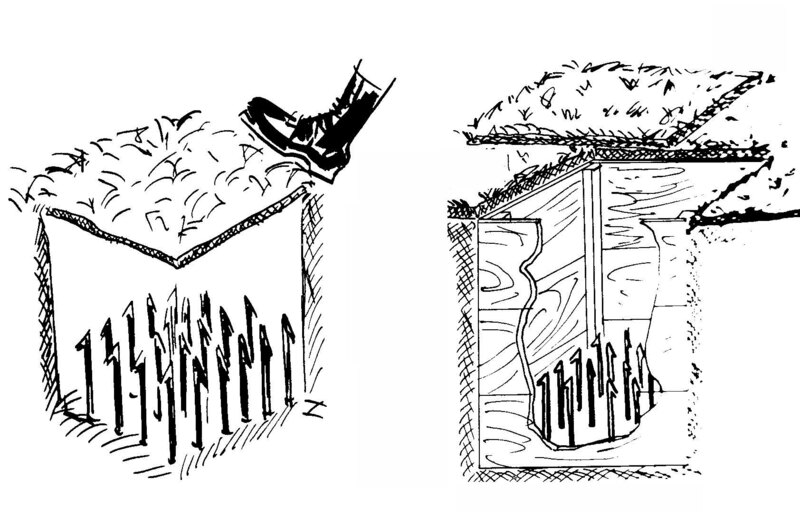 The illustration shows some typical grenades used and one of the most common devices. 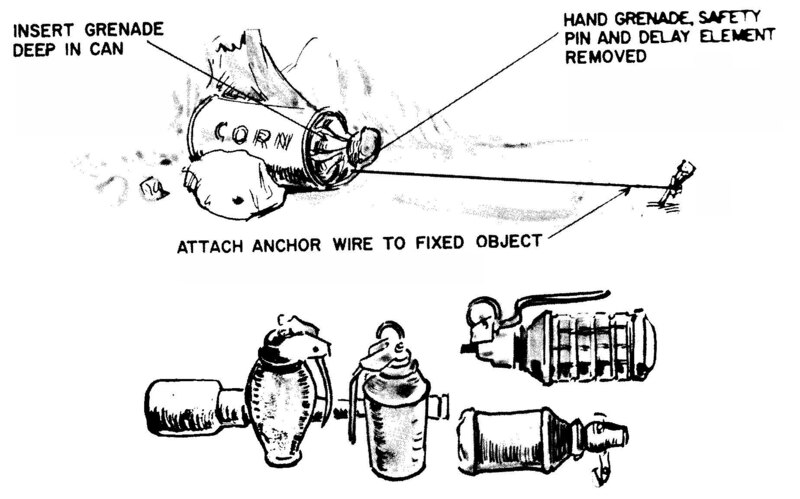 A grenade is placed in a can, the safety pin is removed and a trip wire is attached to the grenade. When the victim hits the trip wire, the grenade is pulled from the can and explodes. Normally a zero time delay fuze is used. Another common method is to weight the lever of a grenade with some object and pull the safety pin. When the victim picks up the object the grenade explodes. Tying a wire to the pull ring on a grenade and securing the grenade to an object is also used. When the victim hits the wire, the ring is pulled and the grenade explodes. 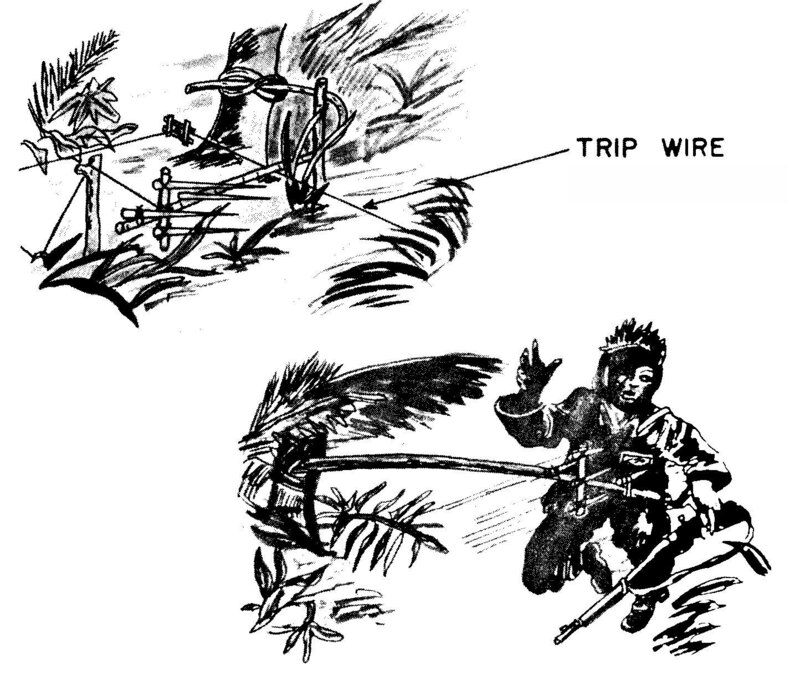 This trap is also a Malayan whip like the one shown above, except it swings down from tree tops. 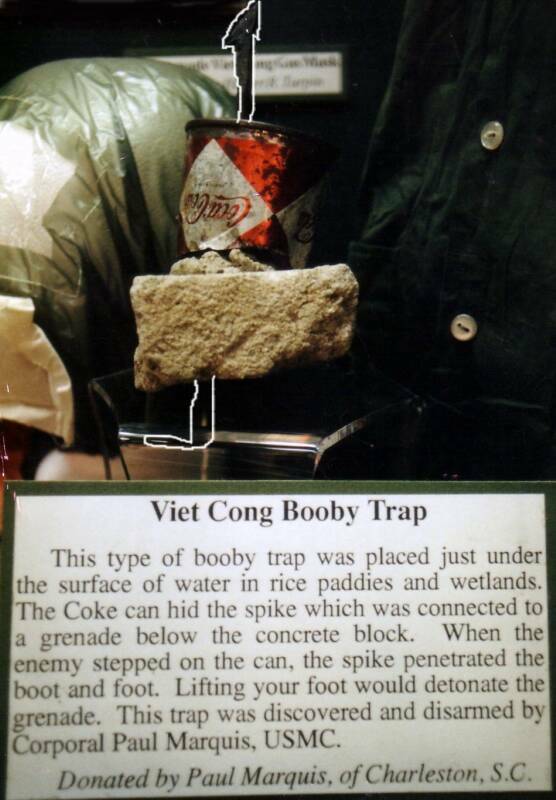 I found this booby trap while on a road sweep that was made every morning out of the base camp near Marble Mountain. 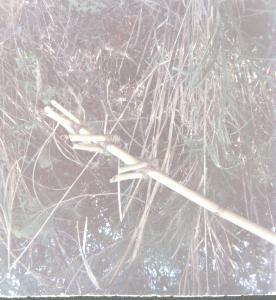 It was next to a rice paddy dike. 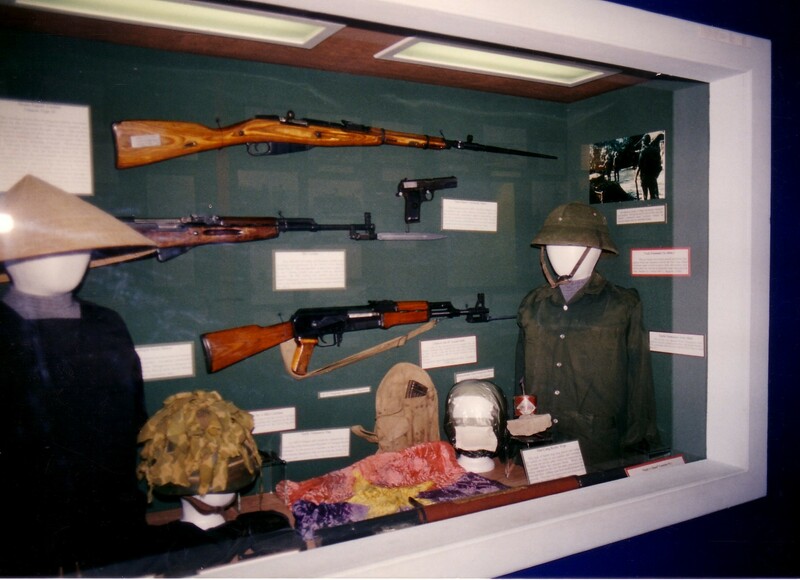 In this photo you can view the booby trap on lower right as it sits in a display case in the Marine Museum at Paris Island. Also shown, are captured weapons, NVA flag. NVA helmet, and VC cover. 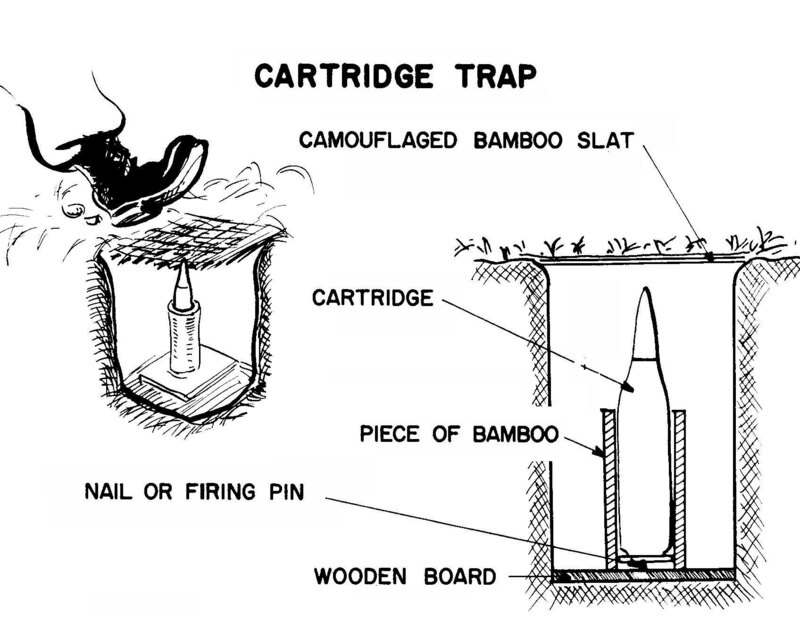 Thank you for your donation of the Viet Cong Punji Spike Booby Trap.Your donation is a welcome addition to our collection and has been accessioned as 1992.34.1 OR. 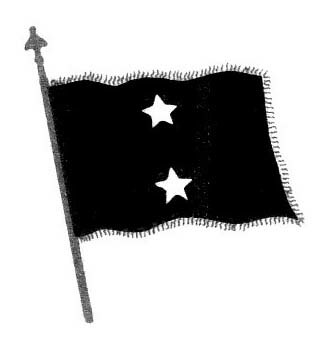 In order to couplete our records on your gift, we would appreciate it if you would please return one signed copy of the enclosed Deed of Gift in the envelope provided. 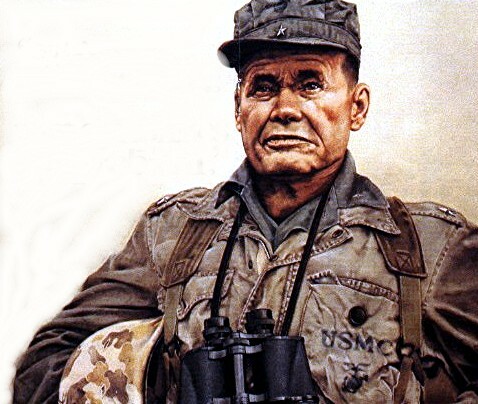 Your continued support of the Marine Corps' historical program at Parris Island is appreciated.Again, thank you for your generosity and for your interest in Marine Corps History. Shown below, copy of letter from the Commanding General Marine Corps Recruit Depot, Parris Island. 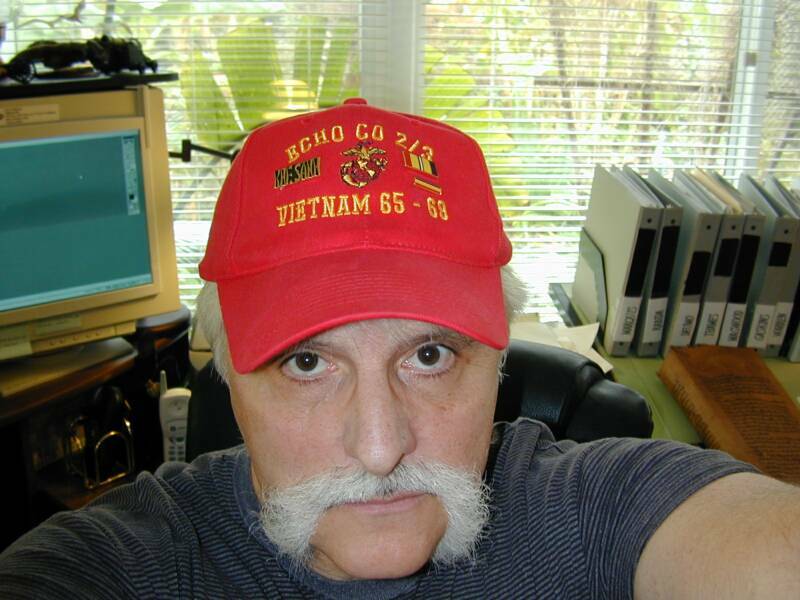 The material on this web site is the sole property of Vietnam Veterans of Bravo Battery 1Bn 12th Marines, April 1965-October 1969, and may not be copied or reproduced without prior written consent of the President of said organization.